Sample application Letter to Request the Cancellation of Club Membership, gym membership, library membership etc. I am the member of this club since 2014 and I really appreciate your services up till now. I have been observing for the past 6 months that your management is not cooperative as it was before. Last month I was not allowed to park my car in the parking lot and I have to walk several miles to reach the club. I talked to the manager about this matter and he promised me this won’t be happen again. I ignored the matter and started coming to the club in routine but this didn’t resolve. I am really fed up with your poor management and found another club which is actually near to my home as well. I am writing this letter to request you to cancel my membership as I had complained for several times. I don’t want to be member of this club anymore. Kindly unsubscribe emails and messages from the club as well. The reason I am writing to you is that I want to get my gym membership cancelled for a very valid reason. The reason is that it is very far off from my place and I cannot manage to come every single day. I have found another gym nearby and I wish to pursue my gym sessions there. So, please cancel my gym membership. I shall be thankful to you. This is Tina, member in your club for four years. Respectfully, I want to state that I want you to cancel my membership with your club. I appreciate this place a lot, because I learnt a lot here. Now as I have to move to another city due to my job, so I won’t be able to attend the club. I wish you to always do better and grow with time. Whatever I learnt here will help me everywhere I live. Thanks a lot for the best services you give here. Kindly consider my request and refund my dues as soon as possible, because I have to move early. Hoping for quick response from your side. Sample letter to apply for joining a club of cricket, football, sports club, community club etc. With my all due respect I would like to ask you for a membership of your club, sir I am a big fan of football and I have been a captain of my college football team, I have also won many inter school championships and now I want to make my career in football, and for that I need to join your best academy for football. I shall be really thankful to you if you allow me to be a part of your team. Please consider my interest and love for football. Thanks. Most respectfully I want to say that I want to join your sports club so that I can stay fit and also because I have heard that your club has the best lawns in the town. Please allow me to have the membership of your club. I shall be highly obliged. I am indeed pleased to apply for a membership in your club. By profession, I am a government servant and work for Police Department. My duty hours are in morning and I become free in evening time. The main purpose of joining your club is gaining physical fitness through daily exercise in your gymnasium as your club has latest equipment for exercising. Therefore, you are requested to please allow me to join club and oblige. Sample letter to welcome new members of shopping outlet, club, franchises, hotel, pizza point, etc. This letter can also be used to welcome new employees in the company. 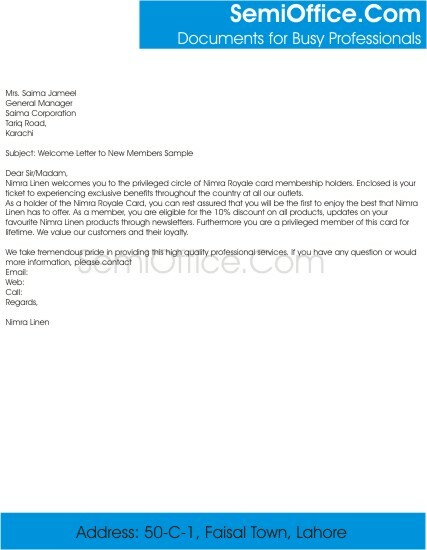 Nimra Linen welcomes you to the privileged circle of Nimra Royale card membership holders. Enclosed is your ticket to experiencing exclusive benefits throughout the country at all our outlets. As a holder of the Nimra Royale Card, you can rest assured that you will be the first to enjoy the best that Nimra Linen has to offer. As a member, you are eligible for the 10% discount on all products, updates on your favorite Nimra Linen products through newsletters. Furthermore you are a privileged member of this card for lifetime. We value our customers and their loyalty. Sir, we are delighted to inform you that your request for membership of HFBS Club has been approved. The membership number assigned to you is 92212. Your membership card has been dispatched and would be delivered at earliest. We hope to satisfy your needs with our services. Thank you. We are pleased to welcome you to our firm as an accounts officer. We expect a great time with you and we expect your attention and sincerity to the work. We always encourage our employees to work hard and encourage them. We treat our employees as family and try to give every opportunity to them. We hope you will have a wonderful time with us and will grow more in our firm. 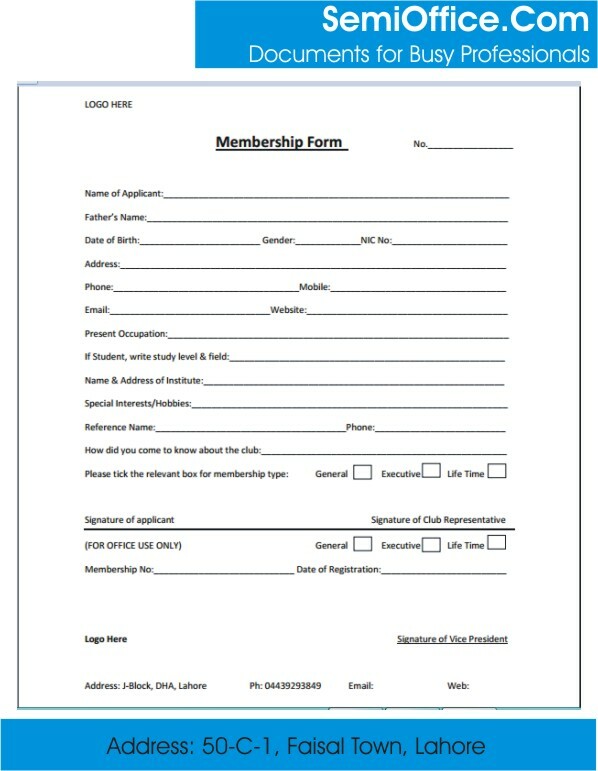 Sample membership form template word for clubs, non profits organizations, libraries, businesses, park, transport, society, school, college and university societies, public societies, town committees, online memberships, parties membership form. etc.